John Henderson was the youngest son of William Dickey Henderson and Sophia Porter of Belfast Ireland. At the age of 21 years he emigrated to Australia aboard the Clipper ship “Orient” arriving in Adelaide on 13th July 1863. What follows below is a transcript of his hand-written account of his voyage, as presently owned by Michael and his cousin John Henderson. Unfortunately, great-grandfather John’s highly articulate and enjoyable account of his voyage ends abruptly on his arrival in Australia. He would have made a marvelous historian. Notwithstanding advertisement we did not clear from Gravesend till this morning about five o’clock. I was on board yesterday at noon and had rather a slow afternoon, although it might have been worse. We would have got away yesterday but the Captain did not come on board till near seven when it was too late to clear the channels. I arose this morning a little after five, just when we had got under weigh. I had the pleasure of making up my own bed yesterday and found that I was quite an efficient chambermaid, for I slept profoundly from nine o’clock till I was awoke by the hurry of hoisting sail. We have two pilots on board: one an old greyhaired man, contemptuous of us and slightly crabbed. He was in the navy before “the ‘15″as he calls it and saw some service. The other pilot is a short stout man, built on the model of a Dutch clipper very broad in the stern. The duty of the former is to clear us to the Downs and of the latter to guide is to Plymouth. We are at present (11.30am) progressing slowly but steadily under all plain sail with a light breeze from the north which, if it continues, will take us nicely to Plymouth. Very few of the cabin passengers have yet joined us -in fact I believe only two besides myself -one a Mr Bickford, who was born in the colony, the other a Miss Sinnett who has not yet appeared either in the cuddy or upon deck. There are more “second cabins” but on the whole we are not as yet a large party. I must not, however, omit to mention of a gentlemanly young fellow called Ellis from the owners office who goes with the ship as far as Plymouth. I have still got a cabin to myself and hope to retain it the whole voyage. I have been much engaged in beautifying it but have not yet got it quite square. We are rapidly approaching the North foreland, and the ship is still as steady as a boat on a river. About one o’clock the wind failed us and about four it returned again but in an unfavourable direction. It was however available again for a short time but towards evening it failed us and we are now lying ingloriously off the South foreland. The pilot expects to go off tomorrow early and it is to be hoped we shall have a more favourable day’s sailing. I turned in last night early and had a jolly sleep till seven this morning when I rose and on reaching deck found that we were just off Broadstairs tacking under a gentle westerly breeze. It has now freshened considerably and we are running for the coast of France, in view of Dover, at a pretty considerable rate. Our present prospect of beating down Channel against a strong westerly wind is not very pleasant. About an hour ago we got rid of our elderly pilot and are now in charge of the other chap who seems rather more lively. It is blowing rather strongly as I write, but the “Orient” is but little affected by the waves, except as regards the usual list to leeward. My anticipations of Monday have been partially realised. All that afternoon and the whole of Tuesday were spent tacking against a sou-wester (not a hat, please observe, but a wind). At the straits of Dover we closely approached the French coast and at another time we were in the centre of a perfect fleet of Mossvo’s fishing boats. The heavy or rather let me say the cross and chopping sea of Monday and Tuesday has told with dreadful effect on our second cabin passengers. None of whom have escaped la malade de mer and only one or two of the more hardy have put in an appearance during the above period. Many of the green hands among the crew have also been sick and I believe the only landsmen who have escaped are Bickford and myself. Poor Ellis has scarcely eaten anything since it commenced to blow and looks like a white handkerchief partially washed. 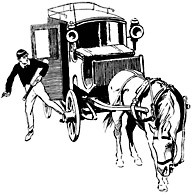 He has been sighing for sometime for a Handsom cab, the sight of which would give him more delight than anything else on earth. Our old pilot thinks that it would have to be worked by steam to follow where we are and with this poor consolation, unfortunate Ellis has to contend himself. The same dirty weather continued all Tuesday afternoon but on Wednesday we had a slight improvement and towards noon or thereafter we headed fair for Plymouth where we dropped anchor early yesterday morning. Mr Ellis, Mr Bickford and myself went ashore and we had the satisfaction of seeing the former with a smile of happiness on his face, deposited safely in the train for London. Bickford and myself had then a warm bath and came off early to the ship. Nothing remarkable occurred during the afternoon except that my spring candlestick behaved in a most disreputable manner shooting out an inoffensive candle as if it wished to knock a hole in the deck. We are now 12.20 on Monday, 1863 heaving the anchor before leaving Old England. It is a glorious spring day with the sun dancing on the waters of Plymouth Sound and I trust that the bright departure may be an augury of a pleasant passage. The “Young Australia”, a crack ship of the Black Ball Line bound for Queensland, lies under our lee and a French sloop of war to windward. I write now to the music of the sailors heaving the anchor and so “Farewell Old England” if not “for evermore” yet for a good while at any rate. The wind at first favourable has now shifted a little, but in fact there is but little wind of any sort. As dinner time today there was shocking defection of those passengers who joined us at Plymouth – only one -Mr Goode, being able to sit it out. Nevertheless there has been no sea of any consequence. Our cuddy table has not been much better attended than when in the Channel, indeed we have scarcely had so large a party. One and all of our new friends are desperately sick and they are divided in about equal numbers between their berths below and the lee side of the poop where they are sacrificing copiously to Neptune. The unfortunate devils will scarcely believe Bickford and me when we tell them of our freedom from the wretched and reaching sickness. The moderate breeze with which we left Plymouth freshened towards the afternoon and still continues favourable. Under its auspices we have made a capital run of over 240 miles and have got a capital start for the Equator. We are now somewhere about the outskirts of the Bay of Biscay and blowing along through an ocean sea with fore and main studding sails (nautical pronunciation stun-sails) set, and before a wind which bids fair to become half a gale. The weather is dull and hazy. Strong and favourable winds have continued and we are making splendid running. 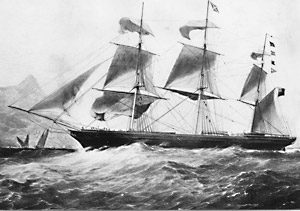 Yesterday we passed several vessels, one of them being a large screw steamer under steam and sail, which we sighted, passed and lost below the horizon in some three or four hours, which was decidedly more pleasing to us than to her crew and passengers. I took her for one of the Liverpool Mediterranean liners from the colour of her funnel. Our position today is somewhere off the coast of Portugal, about the latitude of Oporto, and the wind is fair and moderate with but little sea running. Our sick people are beginning to revive and the cuddy table commences to receive fresh accessions of strength. There is already a marked mildness in the atmosphere. Fine weather continues – favourable winds and cloudy sky and we had a full representation at today’s dinner. We have had no sails in sight nor are many expected till we approach closer to the Equator. Some ardent spirits have begun to practice gymnastics and play rope quoits and I have had several games of chess with satisfactory results. Music, with or without the assistance of our very respectable piano also helps to pass away the time, and to this I also contribute my share. I shall take an opportunity from day to day, as I have time and inclination to give short accounts of my various neighbours in the cuddy, and I shall do this in a systematic way by going round the cabins in their order as they open on the saloon. Captain Harris is located first on the left hand as you enter the cuddy and with him I will begin, but I must premise that now when I am re-writing my “log” I shall describe him as I found him during the whole voyage, for my first impressions of him were decidedly wrong. I thought him to be a quick “say-nothing-to-nobody” sort of person, not much of a gentleman but a good sailor. Judge of my surprise, and that I may say of nearly every other passenger, when I discovered him to be the most confounded humbug that ever wore broadcloth on shore and a Guernsey shirt at sea; a man given to long dreary ungrammatical, unaspirated disquisitions on subjects which he did not understand, and these subjects comprised everything, for he understood nothing; a man who hardly knew the names of the sails and ropes in his ship and who certainly did not know how to work her, and in short a talkative, ignorant, timid crossgrained old wife, who every person found in the way, and without a single redeeming trait in his character but kindness to the sick. Of course we passengers did not quarrel with the captain notwithstanding his absurdities and the daily annoyance his unpleasant behaviour gave us, but we kept as much aloof from his as possible. One of his remarkable characteristics was that he never had the least idea of what people thought of him and I have not the least doubt that he will inform every person that he meets, in his own slightly peculiar phraseology, that we all looked up to him as a perfect “demagogue”. For my part I believe I had the honour, if honour it could be called, of being a prime favourite of his, although I was constantly on the point of giving him “a bit of my mind” which might have opened his eyes a little. Last night we had quite a sensation on board. 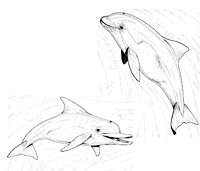 The ship got among a shoal of porpoises which amused themselves by a miniature aquatic Derby alongside. One of the sailors rigged a harpoon and made a gallant attempt to capture one of our visitants but although he struck it, he had not obtained sufficient hold to bring it on board, and after a few struggles it escaped. 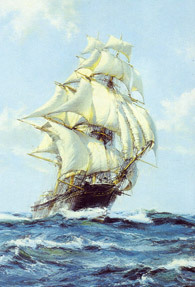 This midday, we sighted a barque 10 or 12 miles ahead and towards midday, we were abreast of her and exchanged signals. She proved to be the “Starbeam” bound also for Adelaide and had sailed before us (Note – she has not yet arrived – 31st July). When we were signalling the “Starbeam” we very nearly fell foul of a large floating log all covered with shells and sea weed. This was really a lucky escape for if we had struck such a huge log at the rate at which we were going we should in all probability have sprung a leak if not worse. In the afternoon we gentlemen passengers had an animated discussion as to the propriety of admitting the second class passengers to the poop, and it was unanimously agreed that while there were many of them we would be glad to see, we could not recommend their admittance as a body. The evening closed in slightly showery but not much wind. We are now somewhere off the Madeiras having made a fine run of six days. It is to be hoped that fair winds will continue and if so we may look for a very rapid run. It still continues rather showery with a moderate breeze. I had my first bath this morning. Our bathing arrangements are extremely simple and consist merely of having a few buckets of water thrown over us. The result is decidedly agreeable and satisfactory. We had a glorious moon last night. Both it and the stars seemed brighter than in our northern latitudes. The skies seem much as usual, except that there are some splendid accumulations of clouds, grander than any I remember seeing at home. The colour of the ocean is now a deep indigo blue, very different from its shade in shallow waters. This morning we signalled a large ship, which we had been gradually overhauling since yesterday. We had some difficulty in reading her flags, but we believe her to be the “Glenroy” for Melbourne. She is a larger ship than the “Orient” and carries more canvas, but we are rapidly dropping her below the horizon. Today we have had the highest temperature yet experienced. I have assumed white trousers and shirt and discarded my waistcoat. Next to Captain Harris, myself and the medicine chest are located. Of myself the less said the better and of the medicine chest I can only say that it is a quiet companion. Miss Sinnett occupies the third cabin. She is an invalid and is going to join her brother in Adelaide. She is a very ladylike person and extremely well educated. Her age it would be impossible to guess, but I don’t think she is much if anything over thirty. Nothing of note occurred on Saturday, but yesterday we had service morning and evening. The morning service was conducted according to the Church of England rules and the evening after the fashion of English Dissenting Congregations. Mr Parsons officiated both times and gave us remarkably good sermons. The attendance was very good, and we had singing both times, twice in the morning and four times in the evening, my unworthy self presiding at the piano. Saturday and Sunday were both fine with light favourable winds. On Sunday afternoon we crossed the Tropic of Cancer and at night saw, for the first time, the Southern Cross, low down in the heavens. It is hardly equal to the expectations I had formed of its size and brilliancy. It is formed of four large stars and a small one. This morning was the warmest we have yet had and there was an awning extended from the main to the mizzen mast. Now, towards the evening it is milder and there is a heavier sea on, than we have had for the last week. The old “Orient” is rolling about as I write in rather an undignified manner, and it strikes me that the tanks, spare spars, sheep pens etc., with which the deck is encumbered make rather too heavy a top weight. The fourth cabin is occupied conjointly by Messrs Parsons and Hender. The former is a Baptist clergyman not going out to a congregation, but with an income guaranteed for two years. He is one of the best fellows I have ever met and is a universal favourite on board from his good nature and talent. His berth mate Hender is a confounded young donkey, but on the whole I believe means well. He is not much thought of by the other passengers. Yesterday was rather rough and some of our community took the opportunity of again resorting to their bad habits of sickness. We sighted some ships in the afternoon and overhauled them with an almost magical speed, indeed nothing that we have yet seen can come within 2 or 3 knots an hour of us. On Monday evening we had a meeting in the Cuddy, when it was decided to start a journal on board to be called the “Orient Afloat” and Messrs Bains and Blyth were appointed co-editors. Yesterday several flying fish were seen and this morning one jumped on board. It is about the length of a herring but thicker, and its fins are elongated to about the size of a swallows wing to which they also bear a considerable resemblance in shape. Today is very fine and not so rough -there is a beautiful “mackerel sky”, and the heat is considerable. The excessive heat of Thursday and Friday produced a laziness in me, which entirely precluded any entries in my log. We have seen a great number of flying fish which is the only event of moment. Yesterday evening we had our first practise of sacred music, which was very successful. I presided at the piano. Last night I slept on the deck very comfortably and was up in time to see a glorious tropical sunrise. I had my bath before six in the morning. Today is not so warm, as we have a delightful fair and moderate breeze, which is rapidly bringing us to the Line, now only 250 miles off. We think that the run we have made so far is nearly without example and if our good luck continues we will make a splendid passage. The oldest seaman on board has never gone so close to the Equator in such a short time. Yesterday afternoon the favourable breeze died away and towards six o’clock a heavy squall of rain and wind came on, when the captain showed “funk” most considerably. The squall was not serious and the wind soon died away but heavy tropical rain continued all night. Today is warm and bright but we are making little or no progress. We are now about 5 degrees from the Equator and we fear some detention till we get the S.E. Trades about 2′N. I rose about six this morning to see some sharks which were near the ship. I only however succeeded in seeing some “skipjacks”, a fish rather larger than a mackerel, which jumps a good way out of the water. Towards the afternoon however, we saw some large “blackfish”, a species, I believe, of the whale. We had service on the poop this morning and I had the honour of acting as precentor. Mr Parsons , as usual, gave us a good and short sermon. The service yesterday evening in the Cuddy was well attended and interesting. We had the finest sunset we have yet seen during the voyage and it certainly exceeded anything I have before witnessed. One remarkable feature was a rainbow on an approaching shower which though distinct as an arch, showed the prismatic colours but faintly, from the bright roseate tinge thrown over it from the western sky. Rain squalls still continue and there is very little wind, so that our progress is but small. Heat oppressive. This morning we signalled the ship “Commodore”, 98 days from Manilla and homeward bound, which promised to report us. We are all of us rather disappointed at not getting letters sent home by her, which we could easily have managed had the Captain chosen to give himself a little trouble. Yesterday morning we caught a small shark between 2 and 3 feet long, which was fully consigned to the frying pan. I was not curious enough to taste it, but I believe that it had a particularly fishy flavour. Today the first number of the “Orient Afloat” was duly launched. I have not yet had an opportunity of reading it throughout, but what I have seen is decidedly flat. The Editors had a communication from Neptune today announcing his intention of shortly paying us a visit. We have been becalmed since yesterday and the heat has been oppressive. Occasional squalls have however relieved our tedium. Tonight, while I write (7.45pm) the thermometer stands at 82′, which however represents a much higher temperature than the same height would do on shore, at least I judge so from my own sensations. Probably the cause is in the dampness of the atmosphere. We are now about 200 miles from the Equator and in long. 23′50W. In our cabin arrangement Baines and Bickford fall next to be mentioned. Bains is a very fine fellow indeed and is a universal favourite. His father is one of the proprietors of the Leeds Mercury. Bickford is my chief friend on board. He joined at Gravesend, which circumstance, together with the fact that we both escaped seasickness, and stood in that respect alone among the passengers, have thrown us much together. He is a very good tempered fellow and a jolly companion. He was born in Adelaide and has only been three years in England. The cabin tenanted by these two chaps is a regular house of call in the evening and we sometimes sit talking and smoking there till well on in the night. It is an undescribably confused little den. Books, portmanteaus, tooth brushes, dirty clothes, tobacco and various articles of days strewn about in wild confusion with an atmosphere heavy with tobacco smoke, show clearly the easy going, jolly sort of fellows the occupants are, and in spite of all the “impedimenta” it is, as mentioned above, a favourite place of resort. Nothing new – rain, heat and slight winds have been the characteristics of the weather. On Friday evening we had our usual practise of sacred music, which went off successfully. We tried over the anthem “I will arise” and intend to sing it at the service this evening. Yesterday was a great day. We crossed the line about ten in the morning, and Neptune came on board in the evening with immense state. He was seated on a gun carriage, which was drawn by two mysterious animals, supposed to represent donkeys, and accompanied by his most gracious Queen and son. His attendants comprised constables, doctor and secretary. He was received by the Captain, officers and passengers on the poop and such of the latter as had not previously crossed the Equator, were received into the Seagod’s family and testified their sense of the honour by the payment of a small sum into his treasury. After this there was some shaving of beardless individuals among the crew, and various innocent larks were indulged in, such as throwing flour into the eyes of inoffensive personages. On the whole the proceedings were very amusing and conducted with most becoming propriety. After rather a lengthened stay in the forecastle, where liberal grog was dispensed, Neptune departed in a fiery chariot which was most suspiciously like a blazing tar barrel. Yesterday the breeze freshened considerably and was pretty strong at night. Today, we are progressing at a good rate with a considerable list to starboard. The service this morning was held on the poop and Mr Parsons was as usual up to the mark. The service was interrupted for a short time by our meeting a homeward bound barque the “Spirit of the Day” from Shanghai, which passed within speaking distance. As she flew past with all sail set she formed a most beautiful sight. Perhaps the finest we have yet seen. Another large ship which we passed during the night is full in sight astern, but we have not come close enough for signalling. It has been a regular match of sailing between us all morning but we are now decidedly showing her our heels. Several other vessels have also been in view today, but more remote than those I have mentioned. I should perhaps mention that there was grog in the Cuddy last night as well as in the forecastle, and that the healths were drunk, after the usual loyal toasts, of the Captain, Mr Parsons, myself, sweet hearts and wives (a regular sea toast) and the ladies generally; so that we had quite a nautical jollification. I say so and I hope so. I say old man, your horse will die! The effect of this song, chanted by some thirty stalwart fellows is quite electrifying not to speak of being particularly amusing. When the procession reached the Cuddy door it was discovered that the singers were dragging a representation of a nondescript animal (evidently a near relation of Neptune’s chargers) the appearance of which excited extreme amusement, which was by no means lessened when another animal of apparently the same genus, was seen following as chief mourner. With slow, solemn steps the procession ascended the poop and after the Doctor had pronounced the animal really dead, it was committed to the deep with the same comical solemnity, which had characterised the previous proceedings. On Monday also rather a gloom was thrown over our little community through an accident which happened to our friend Mr Parsons. When engaged in some gymnastic exercises in the morning, he fell on the deck and injured his knee cap. He rather disregarded it at first till towards midday he suddenly fainted away upon deck. As my cabin is more airy and better lighted than his, which also he shares with a companion, I have exchanged with him till he gets better. I spent most of the day on Tuesday reading to poor Parsons and there is little of note to be recorded except that the sea was rougher and that, although the weather is still very warm, and bed clothes continue at a discount, it is beginning to be sensibly cooler. On Wednesday we had heavy squalls of wind and rain, one of which carried away the flying jib. We passed in the afternoon a large ship, the “Ocean Home” for Otago, 46 days out from London. We went so close that we could notice the seas, which while affecting us but slightly, were dashing over her forecastle and running out through her hawse holes and scuppers. For nearly an hour we were abreast of the “Ocean Home” but she soon after fell astern and towards sunset only her Royals were visible above the horizon. Shortly before sundown I got rather a heavy fall on the slippery and almost vertical deck, and although not exactly stunned was unable to rise without assistance. I went to bed rather early in consequence and have no other events to record. Our days are so like one anther that, when I try to remember what took place even two days before the time I write, I find difficulty in doing so. Thursday and Friday passed off quietly. On Monday we had one weekly practise of sacred music which got on pretty well. We passed today a large barque, name unknown, from Hamburg to Melbourne, 47 days out. We are about 190 miles today N.W. of Trinidad, 2400 from the Cape and 8000 from Adelaide. The distance we have come is 4000 miles. On Saturday evening a large booby flew about our stern but we were not able to catch it. Yesterday, being Sunday, we had service morning and evening as usual. I am glad to say that Mr Parsons was sufficiently recovered to preach both times. The prayers, however, in the morning were read by the Captain, but in such a style as to produce more laughter than reverence. The evening was delightful -the moon was throwing down such a flood of light that we could read by it, while the sea was calm and the only drawback was the absence of wind. This morning was wet and dull, but now, towards noon, it is beginning to freshen and blow from the S.W. We saw seven or eight dolphins over the side this morning. They were small, but most beautiful, as they seemed like so may fish of silver. On Sunday night also I was called up to see a grampus blowing astern. It blew rather strongly yesterday afternoon, and our royals, flying jib and fore and mizzen top gallant sails were stowed and single reefs in the top sails. Last night there was an eclipse of the moon, and although the evening was cloudy, we had several good views of it. This morning is fine and bright, fresh breeze and head sea, we are not making a good course. Our life on board is rather monotonous, our staple amusements are walking and singing on deck when weather permits, and at other times we resort to whist, chess and the piano. There is no gambling on board and no drinking to excess and we are all good friends and sociably inclined. Meal times are anxiously looked forward to as something to mark the progress of time, and we do as much sleeping as we can well put into the 24 hours. If any person reads this who is coming on a long voyage I would advise them to bring a chair for sitting on deck in warm weather, a pair of galoshes for wet days, and a pair of canvass slippers for dry ones, with a broad rimmed light felt hat and a cheap sou-wester, add to these a good big railway rug and perhaps a suit of sailors oilskins, and you will be as happy on shipboard as was the boy who killed his father. We left the tropics yesterday morning and today we feel the rapid approach of the Southern winter. I got back to my cabin last night and was very glad to get under the blankets for the first time for a good while. We had a good many sea birds round us this morning for which the prettiest was the Cape Pigeon, other sorts were Cape Hens and “Mollyhawks”. In the evening we were nearly becalmed, and we had an amusing game of proverbs on deck. On Thursday morning a Cape Pigeon was caught and after closely examining it and finding it no less beautiful on a near inspection it was let looser to rove at will. For the first time also, we saw an Albatross. He is a most magnificent bird. The one we saw being probably about 12 feet from tip to tip of his wings. All these birds are most graceful flyers keeping up with, and passing the ship apparently without effort, and certainly without flapping their wings. We did very little sailing all day but at night the breeze freshened and we are this morning going through the water at a good rate, with scarcely any heaving or rolling, and making good course. Yesterday afternoon the breeze freshened considerably and as a natural consequence a very heavy sea was soon running. As it is, there is a favourable breeze and we are making good course no one can complain although we are rolling about rather unpleasantly. I am happy to say that although there are some pale faces yet there is no one quite sick among the passengers. We had our usual practise of sacred music last night, which was well attended considering the weather, and I think I can see some improvement in the style of singing. Some important parts of the rigging were carried away this morning but no doubt the mischief will be repaired. We have had a day or two of rather rough weather with heavy seas. The most unpleasant part of this is that it is difficult to sleep comfortably, one is so knocked about during the night. I don’t know whether we may have much higher seas, but at present I don’t consider any wave a large one unless when it hides the horizon and a part of the sky. On Saturday and Sunday we made good course, but today we are running nearly N.E. Yesterday we had our usual services, but it might be called religion under difficulties from the way the ship was rolling about. It is now getting much colder, the wind blowing from the S. Several Cape Pigeons were caught yesterday and today, by the simple agency of a piece of cotton paid out over the stern. In this the birds entangle their wings and can then easily be hauled on board. Cold and squally weather continued up till this morning, which is fine and bright with a steady breeze, taking us however too much to the N.E. More birds than ever have been with us since last accounts, hundreds of Cape Pigeons, Cape Hens, “Mollyhawks” or “think pots”, two or three Albatrosses, and other minor feather notabilities. It would seem as if the Southern Hemisphere had a monopoly of ocean birds, for as it is now colder than the mean of British temperature, climate alone cannot have the effect of limiting their flight. Tonight we are making rather a better course than in the morning. We yesterday passed a large barque the “Queen of Avon”, 56 days out from London and bound for New Zealand. In the evening we had a jolly game of proverbs on deck. We had some good sailing yesterday but today there is little wind and as there is plenty of sea, our motion is not particularly agreeable. Miss Marshall is the next of our cabin passengers. She commenced the voyage as a second cabin passenger but by arrangement with the captain has been promoted to the Cuddy. She hails from Downpatrick, is short, ordinary looking, and good natured, plays passably on the piano and is about, say, seven and twenty. she is delightfully vulgar, but on the whole is a great favourite. She goes to Adelaide to marry an individual in the grocery trade. (Note 14th August. She got married two days after she landed.) Mr and Mrs Blyth are next in order (“Passing outwards from the sun, you understand”). They are a newly married, wealthy young couple, and when they first came on board tried rather to stand aloof from the other passengers, but as the novelty of the honeymoon wore off, they became more sociable, and I think are looked upon as a jolly pair. They return to England in a short time via Melbourne, Sydney, Mauritius and I believe the Cape. Their trip is partly business, partly pleasure. Yesterday afternoon and night and this morning have been the roughest we have yet had. The sea has been really mountainous, and the logbook confesses to a fresh gale. Notwithstanding everyone’s spirits seem to rise with the certainty that every hour is carrying us to our destination at the rate of over 11 knots (say 13 miles): our last day’s run being 270 miles. Our good ship has borne herself nobly and has taken, comparatively speaking very little water. Some has crept in between the bulwarks and the deck, and two little seas contrived to get over the gunwale onto the poop (16ft above the level of a calm sea) but on the whole we may consider her a wonderfully dry ship. Of course we have had very little sail set, and for the first time the mainsail has been in. Next door to Mr & Mrs Blyth reside the Doctor (Martin Brunges) and little Sangster. The poor doctor is awfully frightened at any rough weather, and is credibly reported to have been seen on his knees several times during the late heavy winds. Poor fellow, it is his first voyage and all his professional starch has been washed out of him in a most summary manner. Little Sangster or as he is better known “old Sangster” from the fact of his only being aged about 14 years, is a regular little brick. His father is a Church of England rector, somewhere in Yorkshire, and he himself is quite a little gentleman. He is sometimes rather dull, thinking probably of home, but on the whole keeps up like a man. He goes out to join his uncle and aunt. Tonight is very likely to blow as hard, if not harder, than last. As I write, I feel the waves dashing against the side, making the old ship quiver in every timber, and it is only a minute ago that I told Parsons, who is sitting opposite to me on the occasion of a heavier lurch than usual, that if he fell on the top of me across the table, I should certainly pitch him back again. Saturday afternoon I had the luck to discover a large whale close under our stern. It showed above water six or eight times and was estimated to be about sixty feet long. At the time there was a tremendous sea running. Yesterday, Mr Parsons officiated in the Cuddy. At noon we were exactly in the longitude of Greenwich, latitude 38′48 S. This morning is squally and cold. If I ever rewrite my journal for the perusal of other eyes than my own, it may amuse them to know the articles that comprise my present costume. Two pairs of socks, woollen and cotton, a pair of shoes and another of galoshes protect my feet, while I have two shirts, two waistcoats and a coat looking after my body. On my head is a white “Johnny Rind” generally held on by a mauve scarf bound over the crown and fastened under my chin. In the evening I add to this an overcoat, and on the whole I cannot complain of much discomfort. Yesterday afternoon we saw two new sorts of birds, the whale bird and the snow bird, both very pretty. The evening set in squally and cold and occasionally the wind increased to a whole gale. During one of these periods we made over 14 knots by the log, which always shows, with a following sea, one or two knots less than the actual speed. Another of these squalls during the night was so violent, that the mere sound of the wind “soughing” through the rigging sufficed to awaken me. These squalls were accompanied by hail and snow – which is something new in June. This morning is fine and bright with a fresh breeze and heavy sea. I should record an accident which happened to me yesterday and which might have been serious. I was standing on the medicine chest driving a nail in the roof of my cabin, when a heavy roll sent me flying right over on the top of my head, into my berth, narrowly escaping the wooden side, which would indubitably have split my skull, thick as it may be. As it was, my neck was the only part hurt, and to this Mr Goode applied a homoeopathic preparation with so much success, that this morning I am nearly quite better. Two or three more days have passed with rough Cape weather, but few incidents worthy of note. On Wednesday evening we had a very amusing concert on deck, every one attempting to imitate some animal and the failures were frequently as funny as the successes. Then Bickford gave us an Australian native song known as a “corroborree”, the principle feature of which is savage howling, with immense applause. I have no remarkable events to relate. We are still making good progress and the weather, although cold, is now fine and bright. On Friday we practised sacred music as usual and introduced a new tune with success. Yesterday we had our usual services in the Cuddy which were well attended. Mr & Mrs Goode occupy the cabin next to the last described passengers. Mr Goode is reputed to have made a large sum of money in South Australia, and he is now returning after a three year’s holiday in England. They are very nice people, without any pretension and are pretty general favourites. About fourteen of the forward passengers are coming out under Mr Goode’s eye, and look to him to get them placed in Adelaide. On Monday afternoon the weather became most disagreeable, cold, wet sand dismal. Yesterday although cold was fine and bright and our spirits rose in proportion so that we had quite a jolly day, but no incidents worthy of note have taken place. Today is not so fine but not at all unpleasant, and we are making good progress, and are expecting to reach Adelaide in about a fortnight. All day on Monday and all night also a very careful watch had to be kept for a rock, supposed not to be far out of our course, but the position of which is not clearly ascertained. We were certainly all the time in shoal water although no shoal is marked on the charts, but the rock did not put in an appearance. All the part where we were, near the Crozets or Desert Islands does not seem to be well known. Yesterday afternoon it blew a moderate gale, and up to noon today we made a splendid run of over 325 miles. Very little has occurred amusing except perhaps the fun we all take in frightening the Doctor during rough weather, with vague hints of leaks, ships foundering, masts going overboard and all sorts of nautical bogeys. Last night the ship rolled so tremendously that my unfortunate tobacco jar was thrown from what I thought a most secure place and its lid was knocked to slivers. Some idea of the roll that unshipped it will be had when I record that the whole height of the jar is only 4 inches and that it was secured in its place by a ledge an inch and a half high, over which it had to fall. On Friday afternoon Mr Tate, the first mate, told me that he suspected we were in the vicinity of a cyclone and all day on Saturday and Sunday he said that the signs of the weather confirmed him in his opinion. These cyclones are revolving winds of the most dangerous character and the unfortunate ship that gets into or near the centre of one is pretty safe to be dismasted. About eight o’clock yesterday evening it commenced to blow in earnest, and before long every stitch of canvass was taken off the ship but two close reefed topsails. As usual the captain showed the white feather and said in the presence of the lady passengers that he didn’t know what to do with the ship. A difference of opinion between the captain and first mate, as to how to get out of our danger was luckily decided by a reference to Peddington’s “Law of Storms”, which showed that Mr Tate, as usual, was right, and that the course the captain was steering would have carried us right to the centre of the cyclone. We soon got laid on a better course towards four or five this morning we had run far enough out of the gale to allow a little more sail to be carried. 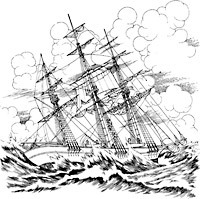 This morning there is a tremendous sea running and the ship has taken a good deal of water on her main deck and slightly shattered part of her bulwarks. It is still squally looking and I have just come down from deck to avoid a hail shower. I am glad to say that the passengers, ladies and all, were quite cool throughout our decided danger and the only persons whom I could say were frightened were the captain and doctor. There was not, however, much sleep in the Cuddy last night. On Friday we had our usual practice of sacred music which was badly attended. Yesterday the services were held as usual, which fact speaks strongly for the balancing power of our worthy chaplain and for the strength of his “leeleg”. We have made some splendid runs during the last few days and hope shortly to reach our port. What extremely lucky people we are to be sure! Today it is blowing as strongly as it did on Sunday night, so that we have the immense satisfaction of having two gales in one week. The barometer has reached a lower point than it has done yet, and while I write, sail is being shortened as fast as it can be taken in. Yesterday was rather a fine day, but towards night it got heavy looking and today, as recorded above, it is blowing like a cart load of bricks. Wednesday night: the wind has now gone down but it is still slightly threatening and there is a nasty cross sea running. Those that have not seen ocean waves can have little idea of their appearance and force. Sometimes the old “Orient” will ship a great white sea right over her bulwarks so thick and heavy as to hide the main mast from a person standing at the Cuddy door. On Monday, when standing on the poop, I saw the gig hanging on the starboard quarter, some eighteen feet above the level of a calm sea, go right into the water and the next lurch sent the poop right under water on the port side so that the hencoops were floated and would have been carried off but for their strong lashing. As it was, when the vessel righted they came with such a bump on the deck as to make those below think that something awful had happened. It is easy to imagine from this that it is difficult standing upright, and yet most of us have got our sea legs so well that it is a heavy roll indeed that makes us hold on. Yesterday was an unpleasant day, cold and damp, with nearly a contrary wind, and not much of that, but quite sufficient sea to produce a most unpleasant motion. Today is quite the reverse – a glorious sunshiny day, as bright as the weather was in the tropics but of course cold. We are told that this is an Australian winter day: if so, Australian weather is the right sort of thing. I must now have a word of Mr Tate, the first mate, who is the only occupant of the Cuddy, except the stewards, who remains to be mentioned. Mr Tate is probably the most universal favourite on board. He is quite a gentleman, and holds a higher certificate as master than our old women of a captain. (Since landing I have learned that Captain Harris is known among the gulf pilots as “Mother Harris”.) He was master of one of Dunbar’s ships, and on the death of Dunbar was thrown out of employment. This is his first voyage as mate since he had a ship of his own, but he is promised a command on his return from the present trip. He is a thorough seaman, and possesses a never failing fund of fun and good temper. His stories sometimes verge on the marvellous, but he is never at all affronted by disbelief. He is proprietor of a pretty young wife whom I saw at Gravesend and he seldom talks long without some reference to “my Toodles” or “my old horse, God bless her!” Many and many a time have we good men and true, who are slightly sheltered from the Captain’s endless stories and prosings, by the mizzen mast, which comes right through the table, drunk the hearty good health of “Old Tate’s Toodles, and long life and happiness to them both”. 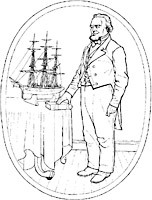 The second officer, Mr Clarke, deserves mention also, although he lives in that terra incognita, the second cabin. He is a chap about the same age as myself and is a through seaman and true hearted fellow. He has never sailed in a passenger ship before but has spent all his seafaring life with drunken captains and blackguard mates, yet not withstanding he always behaves in the most gentlemanly manner. He is also a great favourite with everybody. I am sorry to say that he is at present laid up, and may not be better till we reach Adelaide. As I have mentioned the second cabin, I suppose I had better give a word to it and its occupants. Of it I can say little more than that it is a horrid hole, dark and dirty and not particularly sweet smelling. Many of the passengers are quite nice people in the lower ranks of the middle class. Mr and Mrs Joyner (prettiest woman on board) and child go out with Mr Goode. Mr and Mrs Wright go out, at least Mr W does, in charge of traction engines for the Yudanamatina Mines. N.B. Mrs Wright sings like a thrush. Mrs Trevorrow and Miss Trevorrow accompany them. The former goes to her husband, the latter to get married. They are not relations although they have the same name, go out together, and always lived near one another. I asked Mrs Trevarrow one night how she spelled her name, and she said “A T and a har and a h and a v and a ho, and a har, and a har, and a ho and a W”. Then there are a lot of engineers under Wright, a pugilist, two or three bumpkins who never saw water till them came on board, and a few undescribables, including an old fellow with a tremendous family of small children. N.N.E. and 1309 miles from Cape Borda or Kangaroo Island. As we have averaged about 12 ½ knots since that time we are now under the lee of Australia land, and still going ahead at a good rate. Mr Parsons gave us a concluding service yesterday evening as there is a good chance of our not being another Sunday on board. His text was “And so he bringeth them unto their desired haven”. At dinner on Saturday we were served with nothing but preserved and salt meats, which as we well knew from the quantity of livestock that remained on board was quite unnecessary, and rendered us all desperately indignant. A large body of us left the table before desert was put on and proceeded to take an inventory of the livestock on board, which we did in the most formal manner enumerating the sheep, pigs, fouls and ducks separately. These formidable proceedings so frightened the captain that before long we heard orders given for a sheep to be killed at once. But the best of the joke is to come. On Sunday morning I was lying awake when I heard the steward calling the Captain and telling him that the sheep was stolen! Kill another at once, before the “blessed passengers hear of it” was the order, and sure enough before many minutes another was slaughtered, which had hardly given up the ghost before the first was discovered. Where or how, think you? Why, snugly rolled up in blankets and lying in a hammock in the second cabin with a paper collar round its neck and a tin hat on its head. Of course the perpetrators were not discovered, any person can do anything in this ship without the slightest fear of the Captain taking any sensible means to find him out. Still getting on with fine steady breeze, which has with slight intervals continued for some days. On Monday morning we heard the enrapturing though not very musical sound of bringing up the chain cables from the hidden depths of the vessel and yesterday the anchors were got over the bows ready for dropping. We are getting up testimonials for the captain and officers, the latter very flattering indeed but the former as mild a form as a testimonial can assume and it would not have been given at all, but for the impossibility of presenting them to the officers, without letting him have one also. Many of the second cabin passengers will not sign the captain’s letter at all, although they need have had but little qualms of conscience on the subject for it is nearly all about the ship and her sailing powers and very little about him. Mr Parsons and the Doctor are also to get letters, and the former is also to receive a more substantial testimonial in the form of a purse of sovereigns. Yesterday the fine breeze continued and we are in hopes of sighting Kangaroo Island tomorrow morning. Last night the letters were presented to the captain, officers, doctor and Mr Parsons at a full meeting of the passengers in the Cuddy, and a purse containing &14.5.0 to the latter. 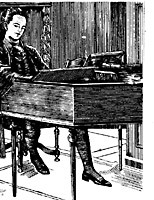 Votes of thanks were also carried and presented to the Editors of the “Orient Afloat” and to myself for my labours in conducting the music, to which I had the gratification of responding in ebullient oration. The meeting on the whole was very agreeable and the proceedings were terminated after singing “God Save the Queen” at the pitch of everybody’s voice, by unlimited grog. This morning is very wet and we have got no sights for the longitude which is rather awkward so near land. It is to be hoped that some observations may be obtained this afternoon. I have got my things nearly ready for going ashore, which is a pleasant operation. At last we have come near the end of our journey and we are now running close under Kangaroo Island with a fair wind and hope to cast anchor towards the afternoon. Friday night was rather windy, in fact it reached to quite a moderate gale, and was nearly contrary. Saturday was a fine day but blowing strongly. We sighted Cape Borda light this morning about two o’clock, and notwithstanding the hour we all turned out to have a look at it. We have already had a glimpse of Australian land, but only a glimpse and our attention fully occupied with admiring Kangaroo Island, the green grass of which very refreshing to our eyes wearied with so long a view of the blue, blue. At length safely landed in Adelaide far from tossing seas and heavy squalls, and no more requiring the assistance of a “leeleg” to maintain my equilibrium. I write these concluding words. On Sunday morning we had service on board which was however but thinly attended, and late at night we cast anchor about 8 miles from Port Adelaide light ship. I came on shore early this morning and reported myself at the Bank and have been told to make my own time for commencing work. I like the people, so far as I have seen them, very well. As first impressions are sometimes valuable I shall record those which I have formed of the colonists from my first view of them. Everyone as to their physique seem dried up by the sun, they do not appear particular as to their attire and “belltoppers” (colonial for hats) are quite at a discount, but there is an appearance of sharpness and shrewdness in the faces I see here, whichshows that they belong to a pushing and energetic people. In conformity with the saying that when “one is at Rome etc..”, and as the time when my old hat was new is long past, I have purchased a tile of a popular shape here – a cross between a foreman’s helmet and a jockey cap with various eccentric ventilating apertures connected with it, and formed of light white felt. A vertical section of this “hat” would be something like this. Today is extremely hot notwithstanding that this is the dead of winter.